I'm happy to visit your school or library or bookstore with my actor husband, Michael. We start off with a PowerPoint slide show of some special animals and follow with a reading from Born to Dance and newly published Safe for life, and a question and answer session about the book, its plot, and how it came to be written. We can also hold writing sessions with groups. After any writing session we're happy to receive finished stories from the children, for positive comment! From Cecilia Busby - World Book Day Organiser for Great Torrington Junior School, Devon. "Katherine Reynolds visited Great Torrington Junior School for World Book Day, along with her book, Born to Dance, and her actor husband, Michael J. Reynolds. 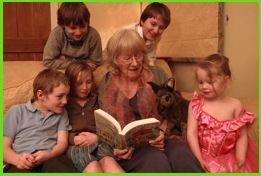 Together they inspired and entertained the children with well-prepared engaging ideas and material and got the children to come up with amazing imaginative ideas for their own stories based on Katherine's book. The event was a talking point for many of them over the following weeks. 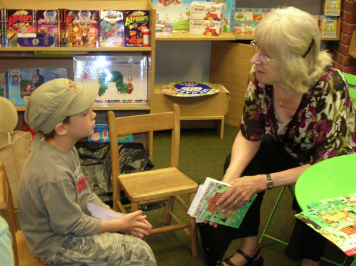 They thoroughly enjoyed meeting a 'real author' and got a lot out of the visit." "The children enjoyed your visit immensely. When I was observing your discussions with my own class, it was wonderful to see how enthusiastic they were. It was wonderful to witness the manner in which you both engaged with each and every child and showed a real interest in their ideas, recommendations and questions. I am sure the children will continue to reflect with a great amount of fondness on this experience both through their discussions as well as in their won writing. Thank you again for helping to make our Book Week such a success and we hope it isn't too long before we see you back at Minehead First School." "The children all enjoyed their time with you and are feeling inspired to write!! We are all very grateful to you for sharing Born to Dance with us and for helping us to create more efficient storytellers."